Portland's premiere new and used furniture outlet, serving the greater metropolitan area since the year 2000. Herman Miller Aeron Office Chairs!!! 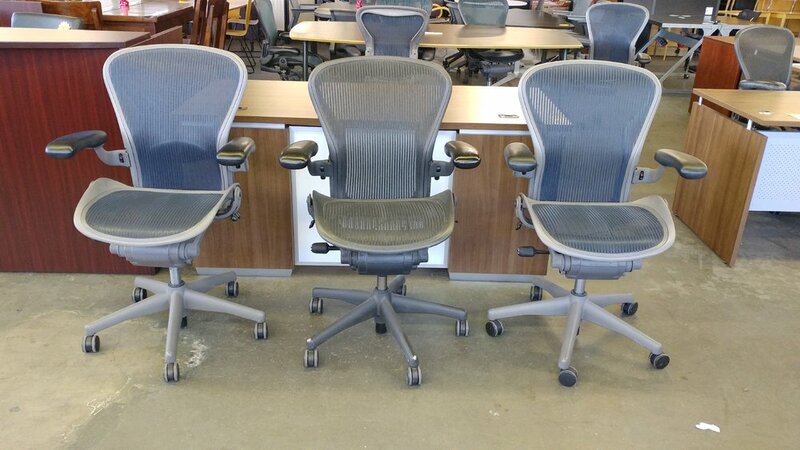 Huge inventory of chairs including used Herman Miller Aeron Chairs, Size "B". On sale now while supplies! Prices starting at $375. These chairs are all mesh, multi-function, and most include the extra lumbar support attachment. Different colors available. Portland Office Furniture-Locally owned and operated. WE DELIVER! give us a call for more details! There's much much more to choose from! We sell quality NEW and USED office furniture at affordable prices. Looking to update your office? We offer free space planning/measuring appointments. Give us a call today at 503-233-9810 for more information. Huge End Of Year Blowout Sale!! Up to 50% OFF!!!! Huge End Of Year Blow Out Office Furniture Sale!! Up to 50% OFF Used Desks and Chairs!! Lots of other furniture also being marked down!! File Cabinets, Verticals, Laterals, Flat Files, Mobile File Pedestals, Bookcases, and so much more at amazing prices!! You 'll be happy you stopped in for these deals! Come on down and get your office setup at a great price! We have all of your office needs and we deliver! We offer multiple options, colors and styles to meet ANY budget. Portland Office Furniture sells high quality new and used reception desks, office desks, conference tables, art desks, drafting tables, chairs, coffee tables, end tables, bookcases, panel systems, and so much more. Give us a call for more details about pricing, or other styles that we carry. Family owned and operated, serving our SE Portland location for over 20 years! WE DELIVER to all areas of Oregon and Washington!! We also offer free space planning/measuring - give us a call for more information at 503-233-9810.